Just ten minutes’ walk up from the central station is one of Stockholm’s hottest hostels, that embraces all that is Swedish. City Backpackers have their own sauna, but if you feel like trying a few more, there’s Viking-themed sauna tours on offer. At City Backpacker’s, you can start your day like a local: the breakfast is a simple Swedish affair of yoghurt, muesli and sandwiches. You’ll also find traditional meals of meatballs, herring and pickles on offer next-door. 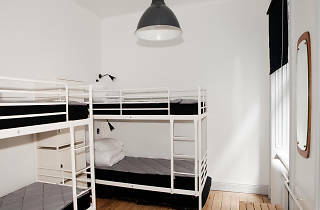 This hostel welcomes backpackers in the traditional dormitory-style accommodation, of course, but if you want to go a little more upmarket, there are also private double rooms available at a decent price. City backpackers sits on the quieter side of the border between Norrmalm and Vasastan, districts of central Stockholm which combine the modern with the traditional. Vasagatan street leads you there from the Central station, lined with pubs, cafes and restaurants that keep this vein of inner-city Stockholm pulsing day and night. 1. Vigårda, Vasagatan 14: For burgers and DJ sets on a Friday night. 2. La Neta: For Stockholm’s best Mexican food. 3. Bonniers Konsthall: For contemporary art at an independent gallery. City Backpackers hostel owns the neighboring Swedish bar and restaurant, Nomad. That means that guests get a discount on their meatballs and locally-sourced tap beer, well worth taking advantage of.